Set up in the year 1995, we are a company offering high-quality Opal Rings, Designer Bangles and much more for our clients. We also provide Metal Sticker Service, Electroforming Services and much more. Our years of industrial experience has helped us gain immense knowledge and information in this field. We have kept thorough track of the changing technology in this sector. Being a highly sophisticated firm it is our genuine effort to provide the finest quality reliable services for our clients. Customers have always preferred us for their business needs and continue to place orders with us right from the inception of our firm through present ventures. Being in the industry for more than three decades we have been able to gain tremendous knowledge and information about the industry. Blending these with innovation and advanced technology we have been able to provide the best quality services for our customers at the most reasonable rates. This has made us greatly preferred company across the country among a large number of clients. Managed under the versatile guidance of Mr. Nitin Katta we have been able to gain top ranking position in this industry within a short period of time. Our highly dedicated and hard working team of professionals, help us in the attainment of several of the firm’s predefined goals and objectives. These professionals are recruited on the basis of their skills and experiences. For the purpose of managing their operations in the best possible manner, the team has been parted into a number of highly operational units. The professionals, further, are trained on a highly regular basis, for reasons of keeping them at par with the ever changing market. The highly advanced state-of-the-art infrastructural facility at Dream Fashion, has been parted into a number of highly operational units. This helps us in the smoother management of the firm’s predefined goals and objectives. The facility laced with all the necessary machinery and equipment, help us in attainment of several of the firm’s predefined goals and objectives. In addition to this, the facility undergoes regular up-gradation, for reasons of maximizing our reach in the market. 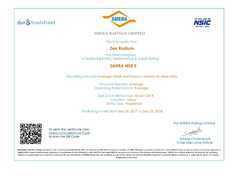 This is to certify that Zee Rodium has been assigned a SMERA & B-NSIC Performance & Credit Rating SMERA MSE 5. This rating indicates Average credit worthiness in relation to other MSEs.